If you look at this footage and think that Charon looks like it comes extremely close to Pluto, that’s because it does, it’s no trick of distance or perspective. 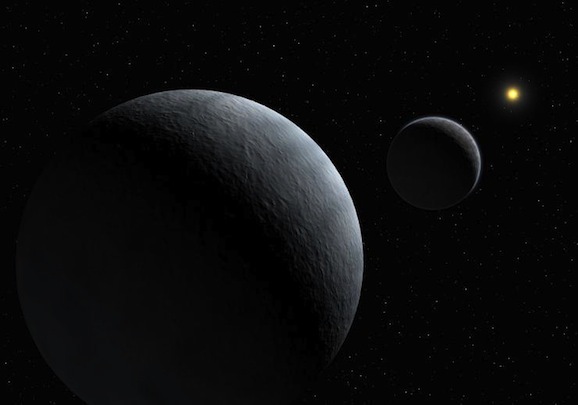 The 750-mile in diameter satellite orbits the dwarf planet at a distance of just 11,200 miles. Our own moon is an average of 239,000, so it sounds like a weekend jaunt from Pluto to Charon is totally a reasonable possibility. You know, after we develop deep space travel and settle on Pluto that is. As a result of this closeness, the two bodies orbit the same central gravitational point, called a barycenter, and you can see this unique movement on display in this video. Though New Horizons has been working hard, it’s about to get a well-deserved breather. At the end of the month, on August 29, the probe’s controllers will put the craft to sleep. That sounds bad, how about, they’ll put it into hibernation, which sounds much more pleasant. This is four days after it crosses Neptune’s orbit, and they plan to wake it back up on December 6 of this year for a flyby. That will definitely be something to see.